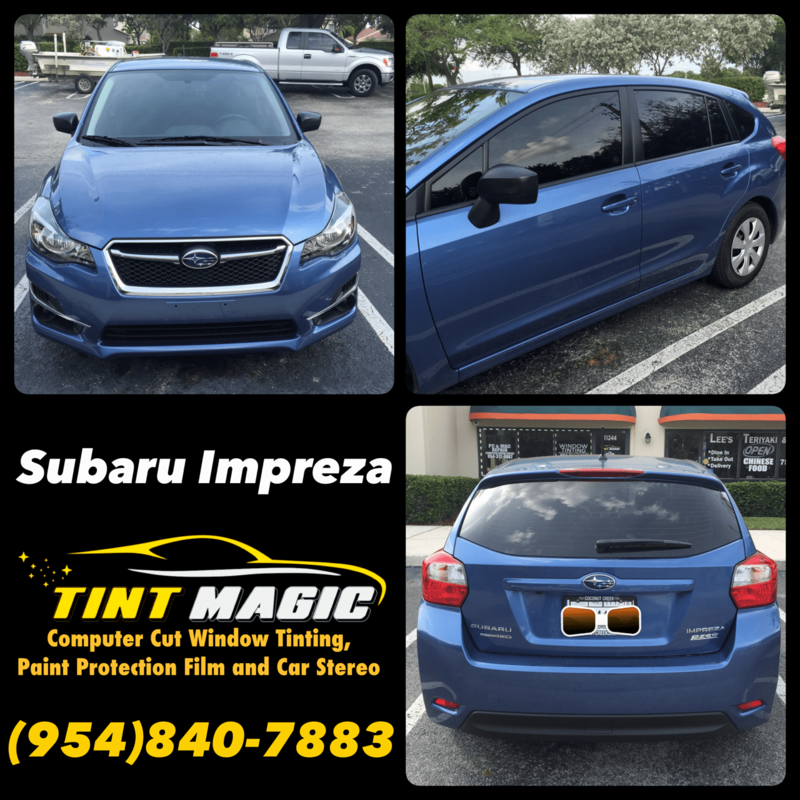 Subaru Impreza Hatchback at Tint Magic Window Tinting Coral Springs, Parkland, Coconut Creek, Tamarac, Margate, Sunrise, Weston, Lauderhill, Deerfield Beach. Call us for the best quality and service! (954)840-7883. We are located at 11344 Wiles Road Coral Springs Fl 33076. Subaru is an odd company in many ways. One such way is its ratio of sedan to wagon sales, which is pretty much the inverse of every other manufacturer except, perhaps, Volvo. Take the Impreza, which sells at a rate of 30 percent sedans to 70 percent wagons—or “five-doors” to use the preferred industry terminology. Honda, for instance, expects the new Civic hatchback to make up only about 15 percent of overall Civic sales. With a hatchback it’s all about the hole, and Subaru widened the Impreza’s. The outgoing hatchback had large singular taillight clusters that, although big and bright, pinched the opening due to their size. So Subaru has split the taillights, putting part of the lens on the liftgate (as so many crossover designers have done before Subaru), thereby adding four inches of width to the narrowest portion of that fifth aperture. The result may look slightly generic, but it makes for easier access to the back. Subaru claims an additional three cubic feet of maximum cargo space in this year’s 5-Door (the company’s official name for the hatchback)—or enough to pack in 827 ears of Indiana corn with the rear seats up or 2472 ears with the seats down. They actually made glued-up corn sculptures in the shape of the wagon’s cargo area to prove it. Because Subaru. And because the Impreza is now made in Indiana.